Lu Nucia is a town located in a fertile valley on the Northern Costa Blanca in Spain. La Nucia is situated fifty-one kilometres to the north-west of Alicante and the airport, and only ten kilometres away from the most popular tourist resort on the Northern Costa Blanca, Benidorm. Altea with its picturesque Old Town is also only seven kilometres away. Valencia Airport is a good ninety minutes away by car. La Nucia overlooks fields and fields of fruits and vegetables and has become a popular place for expats to live as it is so close to the coast yet quiet enough not to be affected by the hordes of tourists who descend on the Costa Blanca during the school holidays. Popular urbanisations in La Nucia include Barronco Hondo, Colloma, Bello Horizonte and El Tossal. La Nucia attracts many shoppers to the town because of the outlet store Labels and Tables which stock many popular high street brands such as Next, Debenhams, New Look, Dorothy Perkins. Worth visiting are the nearby waterfalls at Callosa d’en Sarria and the popular Algar Falls. There are of course a whole host of things to do just minutes away from La Nucia as the theme parks of Terra Mitica and Terra Natura with Aqua Natura are less than ten minutes away by car and then Mundomar and Aqualandia are about fifteen minutes away from the town near downtown Benidorm. La Nucia doesn’t have many hotels but of course there are many hotels within a ten kilometre radius in Benidorm and Altea. To stay in La Nucia itself you can book a room at a couple of budget styled accommodations which are the Los Rayos del Sol and the Hostal Sunami. There are also plenty of self catering accommodations to book privately through the owners in villas with swimming pools or an apartment in the town itself. In truth, La Nucia is very much a small town and so accommodation is limited. If you can’t find a room in La Nucia try looking at Altea hotels or in particular hotels in Benidorm as these towns are much larger and more focused on tourism. Currently there are no hotels in La Nucia although this could obviously change in the future especially with La Nucia being so close to Altea and Benidorm, there must be some demand, especially as the area is very scenic and pretty. Hostels (known in Spain as hostals) are very basic accommodation traditionally used by student travelers and backpackers on a budget. Some hostels in La Nucia will require you to share a room with other guests and to share bathrooms. In some cases there will be a curfew by which time you have to be in the hostal by. Staying in a hostel will be very cheap. Pensions are also very basic (and cheap) accommodation, very comparable to hostels. Eating out in La Nucia is more limited than in Altea or Benidorm but nevertheless El Xato, Nuevo Alcazar, Restaurante Nucia Park, Restaurante Villa Romana and the Restaurante Abdul have been positively reviewed by diners on the Trip Advisor. On the nightlife front most people would just head off to the bright lights of Benidorm but in the town itself every Saturday night you can enjoy Romanian and Gypsy music at the La Nucia Billiards Bar. The Western Bar in La Nucia also provides regular live entertainment. La Nucia is an ideal spot to spend a quiet vacation yet still be near enough to the bright lights of Benidorm with its amusement parks, bars and restaurants. In La Nucia, you can find the Elian’s British School which opened in September 2002. They have students beginning from the age of 1 who follow a bilingual program for a period of 3 years. During this time, the students begin to study the British National Curriculum. Elian’s is part of the recognized educational group lale-Elian’s. Stephanie Wunsch of Wunsch Immobilien shares her fantastic experience about living in La Nucia. “La Nucia is such a good choice to live and buy a property because of the huge alternatives. Here you really find everything you need for a fulfilled life, variety of international restaurants and shops, variety of leisure entertainment and sports, variety of properties, variety of sea and mountain views. You have several international schools nearby, all medical facilities you may need and good connections with public transport. At La Nucia, you have almost every day a refreshing breeze and the opportunity to decide having a relaxed or a lively end of day. The proximity to lively city like Benidorm but also the proximity to smaller Spanish towns and the mountains is what I really appreciate. I also like the combination of international and Spanish neighborhood in almost all areas of La Nucia. The sales prices of most properties as well as the costs of living are convincing and down to earth. Stephanie also sent these photos on La Nucia. Many thanks! Stephanie shares with us some valuable insights about moving to La Nucia as well as the current property trends in the area. Stephanie, would the area not suit certain types of people, i.e. are there any possible downsides? Well, I think that maybe younger people who like to party would feel better in bigger towns like Benidorm or Alicante and those who want to live directly near the seaside should also choose another spot (if they think that an approximate 10-kilometer distance to the sea is too far away). That depends a bit on the area. There are areas with almost 80-90 percent of Spanish population, but there are also areas without, e.g. Norwegian urbanization between La Nucia and Alfaz del Pi. The population of most areas is a mix of 40-50 percent foreigners (from Netherland, UK, Germany, Scandinavia, France, Belgium) and 50-60 percent Spanish people. My favourite things to do here in La Nucia are: enjoying the nature after a hard day at work as well as walking with my dog through the pine wood, relaxing in the pool, meeting friends in local bars, and of course, as La Nucia is the European town of sport, being active at the famous sport center (www.ciudaddeportivacamilocano.com). Also worth a visit is the Mendoza winery which is internationally famous for its wine. You can have wine tastings and make visits of the winery (www.bodegasmendoza.com). One of my favourite restaurants is the El Castillo, between La Nucia and Alfaz del Pi. Very nice food, amazing atmosphere with sea and mountain views (www.facebook.com/Elcastilloalfaz). Also really nice and modern as there is great food and spectacular views over La Nucia and Polop (www.restauranteunoom.es). Very charming atmosphere is also found here at Restaurante Nuevo Alcazar (www.nuevoalcazar.com). international supermarkets like the Supermarket La Nucia with English, Dutch and German specialties. It is a supermarket with international offers. Costa Blanca is also not too far away. You can find LIDL, Aldi and of course a choice of several Mas y Mas and Mercadonas. You can also find some international dentists and doctors (www.policlinicalanucia.es). They speak English, German, Dutch and of course Spanish. Nearly all people in almost all facilities like pet shops, pharmacies, etc. speak at least English. Recommendable to visit are: Polop La Marina and Finestrat. There is another school in Alfaz del Pi, this one is Norwegian. Honestly, as I do not have children, I have no personal experiences with their service. However, all the people that I know who send their kids to the schools really like it. In La Nucia, not at all. There were some robberies in some houses in the past, but as far as I know, there were no other cases that have been reported. The prices of properties in La Nucia of course also went down a little bit within the last couple of years. During the crisis, they have also gone up a little within the past months, similar to the other regions. Most of the time, the prices here were more or less well-balanced. Well this area is not the cheapest one at the Costa Blanca – but also not the most expensive. However, there are still bargains and good offers, depends a bit on how quickly the owners want or need to sell. Anyway, this time is a good time to buy because of the increasing values of properties that are caused by (e.g.) the demand and also the new 27 hole golf court (the only one with that size in the whole area) that is under construction in the area between La Nucia, Benidorm and Finestrat. There are so many different urbanizations which makes it really difficult to describe them all. 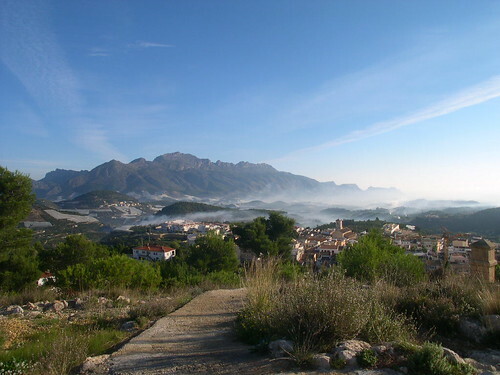 Most of them – as we are in La Nucia – have mountain or sea views. Most have international neighbourhood and most are quiet and offer different types of properties. Most of the urbanization are in short distance to shops, bars and restaurants. And there are no really big differences within a number of the urbanizations. It always has to depend on what you really like in order to find out which area you may prefer. There might be some exceptions such as urbanizations with only new construction. How much are the typical property prices in La Nucia for apartments, villas etc? As the choice and variety of properties in La Nucia greatly varies, there is no average price that exists. You might find a detached house with private pool starting at 175,000 euros although this can go up to as much as 450,000 euros easily. You might get the chance of finding an apartment in La Nucia for the price of 60,000 euros. But of course, as I mentioned above, you might also find really bargains and good offers like a detached or semidetached house in a quiet area with common pool for the price of 100,000-120.000 euros. Any tips and advice to people looking to buy in La Nucia or surrounding area? Yes, feel free to contact me and I’d be very willing and eager to help as best as I can. Stephanie, thank you so much for taking the time to help our readers with your experiences in Spain. If you want to contact her, you can find her details below.